Glasgow Warriors' Dave Rennie was relieved about Scotland's comeback draw against England as he contemplated his side's European meeting with Saracens. The Scots were 31-0 down at half-time before drawing their Six Nations game at Twickenham 38-38. "I must admit I was a bit nervous at half time," the Glasgow coach said. "I thought, if we end up getting a walloping second half, it probably wouldn't auger well for our boys' confidence heading into this game." Glasgow, with a number of Scotland internationals in their squad, are away to the side sitting second in the English Premiership in the quarter-finals of the European Champions Cup next weekend. 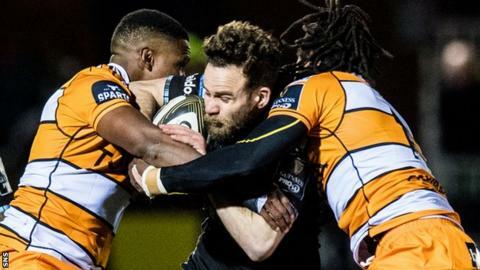 Warriors, who beat Cheetahs 35-17 to stay top of Pro14 Conference A on Saturday, lost to the reigning English champions in both their group games this season. "There were a few Saracens boys out on the park," Rennie said of the international at Twickenham following his side's victory at Scotstoun. "We certainly won't be talking about that, but I'm really rapt that they finished strong and we'll go down with the attitude that we're going to have a real crack at it. We're looking forward to it." Saracens warmed up by coming from behind to beat Harlequins 27-20 on Saturday. Rennie knows his side will have to defend better against a "more brute" opposition than they did against Saturday's visitors from South Africa. "We are pretty clear about what we need to do," he told BBC Scotland. "The challenge is being good enough to put that on the park. "What we know is that we're going to have steel up."